American author of comtemporary western novels. 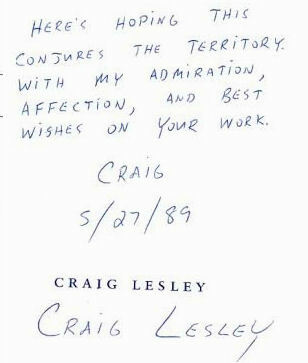 Twice nominated for the Pulitzer Prize, Craig Lesley is an author, educator, editor, and essayist. He was born in The Dalles, at mid-20th Century a small Oregon town on the banks of the Columbia River. His father abandoned his family while Lesley was still quite young. A stepfather, a tough railroad man, made life so difficult that Lesley�s mother fled with him and his baby sister and wound up on Central Oregon�s Warm Springs Indian Reservation where she found work.